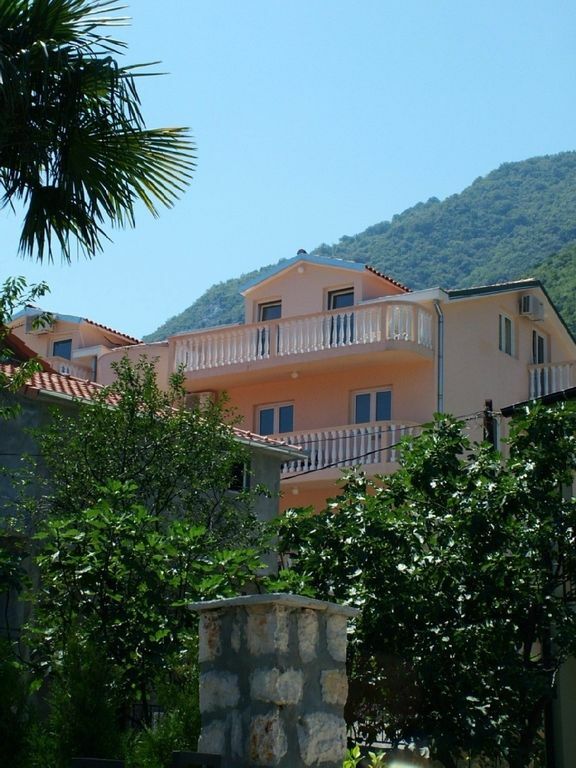 New air-conditioned 1 bedroom (sleeps 4) apartment with amazing views of Kotor Bay and the surrounding mountains from a large balcony. The Apartment is only 20 meters from a small clean beach which is very safe for swimming. Local supermarket / bakery and choice of cafes within 100 meters. A choice of excellent restaurants are within walking distance. Private parking comes with the Apartment. Only a 10 min drive (or Bus ride) to the world heritage listed town of Kotor. The apartment is the ideal position between Kotor and Tivat to explore Montenegro - from its beautiful Bay of Kotor to the Mountains and beach resorts of Budva,Sveti Stefan and villages like Perast. Dubrovnik Airport in Croatia (85km) and Tivat Airport (8km) and both easy drives or organised transfers. We have just had a fantastic holiday in Montenegro. This apartment provided a convenient spot from which to enjoy all that was on offer. Key things: small pebble beach right across the road from which to swim in the Bay; shaded spacious balcony with a beautiful view of the Bay and mountains; we had a car we could park right outside giving easy access into Kotor and to the ferry; a supermarket and a restaurant right on the Bay both within walking distance. There was everything we needed in the apartment. One of our group was a vegan and it was great being able to buy in fresh fruit and salads and have the kitchen supplies. We did find that every restaurant was really happy to adapt dishes or provide delicious grilled vegetables as a vegan option. The highlight was Kotor itself, which is incredible, but we were also able to explore other places including Dubrovnik, Cetinje, Budva, Perast and the Lustica Pensinsula. Back at the apartment we enjoyed relaxing on the balcony to watch the cruise ships sailing in and out of Kotor. The weather was great and we were blown away with the natural beauty. The apartment is clean and big enough for comfort, location is great and provides all the basic conditions. As for facilities, what was promised was what we got. The furniture is simple and functional, the only thing is it could use some more storage space (the drawer was full of extra pillows). The whole building is quiet and well kept, the sea is just across the narrow street. Perfect for those who seek simplicity and relaxation. On driving to the apartment we realised what a good choice we had made. The location is perfect with everything you require within 200m - bar, shop, swimming etc. The local bus stops outside the apartment going in both directions to Kotor old town or to Tivat with the PortoMontenegro (2 must see places). Views from the balcony are outstanding from morning to night. Apartment is clean, well maintained and has everything we expected and needed for our stay. Handover was simple and smooth as there were no issues. The local community and restaurants are excellent and friendly and we would fully recommend exploring around the bay and local areas. All in all this was a perfect location and a holiday where we could do nothing and everything as we please. Nice and cosy appartment for a low price. Great view from the balcony, very helpful owner and managment company. No problems whatsoever. Good place to stay, especially for a couple. A few nice restaurants in the area. Located very close to Kotor, but far enough so that you're able to enjoy a quiet evening at the waterside. My husband and I had a wonderful honeymoon in Montenegro. The place was great an provided all that we needed for a relaxing vacation. we enjoyed having the sea close by, only a 2 min. walk- It was great! there are so many hiking trails and places to walk and enjoy the magnificent scenery. The listings was described well, we understood before we arrived how the place was laid out, as well as with the facilities. the location was not to hard to find. The apartment was very clean and very well maintained. The owner provided many good tips and suggestions on what there was to do and what we needed to do when we arrived- all very helpful. Oh yes! I have already recommended it to all my friends and family! The apartment is on the edge of the Bay (20 meters from beach) and 7 km from Kotor Old Town (medieval walled city whicih is UESCO listed). The shopping town, marina and Airport of Tivat is 8km from Apartment. Jaz Beach 20km with Budva Old Town / Sveti Stefan and Beaches approx 30km. Dubrovnik Airport is 85km. There is lots to do within short walking distances of the Apartment itself with cafes , local restaurants and swimming in the bay! 25% of booking required on confirmation of booking and the balance 2 weeks before arrival. 150 euro refundable damage deposit payable on arrival.